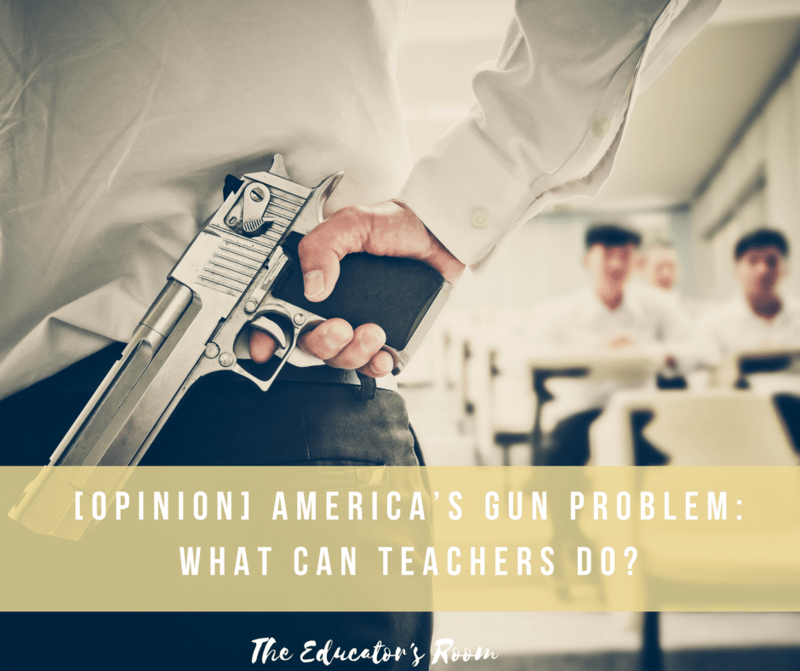 [Opinion] America’s Gun Problem: What Can Teachers Do? It’s been a tough week. If you are a teacher, student or parent in an American public school, the mass shooting in Parkland, Florida that killed 17 people is just as upsetting as the mass shooting that came before it. Memories of the Las Vegas shooting, the Orlando Pulse shooting, San Bernardino, Virginia Tech, Aurora, Colorado, and Sandy Hook are still fresh in our nation’s collective consciousness. While those events were not all school shootings, they were incidents where multiple fatalities occurred and hundreds of lives were altered in an instant. Once again, our nation looks for answers to questions that should never be asked and that are not asked in any other country: how long must we endure mass violence against the innocent, especially our children and teachers learning and teaching in America’s public schools? More importantly, can we look to our elected officials to do something, anything, to stem the tide of bloodshed that seems to be the new normal on the post-Columbine world of assault weapons and breaking news about another mass shooting? Gun violence in the US is worse than anywhere else in the world in part because of our love affair with the Second Amendment to the US Constitution. While the original intent of the amendment is still a subject for debate, the text of the amendment that counts is the clause that reads “… the right to bear arms shall not be infringed.” The Supreme Court has ruled that American citizens may own a firearm for self-defense, hunting, and sport and keep it in their home. But just as other rights in American jurisprudence have limits, the right to bear arms has limits also. States can regulate who can buy and own a gun and they can regulate the manner of its purchase. The federal government can and has instituted background checks and waiting periods, none of which seems to be effective in preventing the kind of violence we have seen accelerate in the past two decades since Columbine. As the media outlet Vox points out, America doesn’t have one gun problem. It has three: mass shootings, gang violence, and suicide by guns. They point out that there is a direct correlation between increased gun deaths and the lack of strict gun control laws in a given state. White males seem to be the perpetrators of mass shootings, while urban black men are the more frequent perpetrators and victims of gun violence among gangs. With the problem so clearly identified, why is our political culture so paralyzed when it comes to passing legislation that could make the United States a safer, less bloody society? The blame seems to sit with lawmakers who operate at the mercy of the gun lobby, namely the National Rifle Association. This special interest group seems to be the most powerful lobby in the United States, pouring money into the campaigns of candidates on both state and federal levels, while mobilizing their membership to vote out of office any legislator or state executive who even hints that common sense anti-gun violence legislation might be a viable answer to the nation’s epidemic of gun-related deaths. Heather Timmons, writing for Quartz Media after the Parkland shooting, points to the NRA as the largest benefactor to Donald Trump’s 2016 campaign, to that of Republican Speaker of the House Paul Ryan. The NRA spend massive amounts of special interest dollars against Hillary Clinton and other Democrats who have called for greater gun control legislation during the 2016 election. The grip that the NRA has over the GOP majority in Congress, over state legislatures, mostly in the South and Midwest, and over governorships with Republican governors in place, is what keeps the political culture in line with America’s gun culture. If the American electorate demands political change on this issue emanate from the halls of Congress and the nation’s state legislatures, then it must elect legislators and state chief executives that are not beholden to the Gun Lobby for the retention of their political offices. So it seems that one way to save the lives of students and teachers in our schools, and of people in our society in general, is to organize the electorate in such a way that those who support common-sense anti-gun violence legislation outnumber, outweigh, outspend, and out-vote those who want to support the Gun Lobby. It should be pointed out, and former Congressman Joe Scarborough did on his MSNBC news broadcast, Morning Joe, that the NRA is not as much a vanguard of gun rights in the United States as it is a protector of gun manufacturers. The AR-15, known as “America’s Rifle” by the NRA, has been the weapon of choice in such mass shootings as the Aurora movie theater massacre as well as the most recent incident in Florida. As a result, lawmakers have consistently voted down any measures that would make it more difficult to purchase or carry such weapons. The Virginia legislature blocked efforts to allow local jurisdictions to restrict access to guns in public places, among other measures, including a ban on bump stocks, the device that allowed for the massive carnage in the Las Vegas shooting. The Democratic Party has called for common-sense anti-gun violence legislation that has been consistently blocked by the GOP-controlled Congress. The Trump Administration actually made it easier for mentally ill people to gain access to guns, a measure that could have contributed to the most recent shooting where a mentally ill former student was able to legally purchase an AR-15 in Florida in spite of numerous red flags that indicated the young man was unstable and capable of mass violence. The 2018 mid-term election gives voters the first opportunity to replace lawmakers who do the NRA’s bidding. Grassroots action such as meetings, marches, letters to lawmakers, and media outlets can begin to educate moderate voters. Intelligent and consistent use of social media should be used to counter any clandestine infiltration by Russian bots or trolls to influence the American voter. Most importantly, one-on-one conversations with voters are the most effective way to get out the vote and to influence policy through replacing legislators who will not put common sense anti-gun violence in place. Knocking on doors is called canvassing in the world of electoral politics. It will be an essential part of the “ground game” in the 2018 mid-term election. To bring a Democratic majority to the House of Representatives will be a gargantuan task, and installing a filibuster-proof majority in the Senate will be even more difficult. Democrats are on the defensive in the Senate in 2018, but they can gain control of key committee chairmanships by regaining the majority in both houses of Congress and in state legislatures. Beyond 2018, the presidential election of 2020 contains too many variables to predict whether or not the Democrats can regain the White House in the wake of the Trump Administration. Outrage over mass shootings is appropriate, but it is essentially powerless unless translated into action. American democracy is a participatory sport, not a spectator one if the people want to change any policy they oppose. The First Amendment offers citizens the freedom to petition the government for the redress of grievances. This process can take many forms: writing, lobbying or protesting. But the most effective method of peaceful change comes when those who develop policy are responsive to their constituents. If the members of Congress and the current administration refuse to act to curb gun violence because they hope to keep their jobs thanks to the gun lobby, then those who oppose the gun lobby must become stronger politically and financially to defeat that lobby. They must mobilize the same way their opponents do, using data, media, and voter mobilization to achieve their goals. Finding and supporting candidates that are running for office that are ready to stand up to the NRA is what every citizen can do to change the gun culture in Washington and in state legislatures. They must act as though their lives depend on it. If anything, their children’s lives depend on it. Good article, but you may have missed a critical point. It does not require Democrat majorities to fix this. It is probably quicker and more effective to reform the Republican party. This should not be a partisan issue. This is about human lives, black, white, Democrat, Republican…our children… I am a registered Republican. But I am currently dis-enfranchised, as I am anti-gun (and anti-Trump). Recently I have only voted in the caucuses, as that is where change can be effected WITHIN the party. There are many like me. Most surveys of Republicans have long shown that the majority are against assault-style weapons, yet our voices have been suppressed. Until now. Gun control might be the next “litmus test,” at least in 2018. At least I hope it is.